Incantation have been making steady efforts to differentiate themselves from the hordes of imitators that have swamped the death metal genre in the last ten years. The period spanning from the release of Decimate Christendom to the present day has seen the veteran band experiment with varying vocal textures and song structures, a cleaner production that emphasizes the latter, a more willing incorporation of the thrashier elements peculiar to late 80s death metal, and the introduction of a perceptibly more melodious aspect to their music. Incantation‘s traditional sound was built on a foundation of rapid atonality and chromaticism, interspersed with generous slabs of heavy, funereal doom. This template, distinctive as it is, isn’t as fiercely individualistic as the groundbreaking nous of a band like, say, Immolation, and as a result has been mercilessly copied and diluted by others without due consideration to the immaculate songwriting practiced by the originators. Incantation have had their hands well and truly forced, and have admirably refused to stagnate, launching feelers into what are new grounds for them; the flipside of that intrepid spirit unfortunately is a dilution in the bands trademark grittiness. Dirges Of Elysium is a watershed record for the band. The door swings both ways from here on out. Dirges Of Elysium boasts of far wider spaces between notes in place of the frenetic alternate picking found on many of the band’s hallmark records, and even something as recent as Vanquish In Vengeance. So much so that periods of stark silence are encountered on more than one occasion, to be pierced by John Mcentee’s anguished acapella ministrations or the smooth caresses of the bass guitar. Kyle Severn rarely lapses, or isn’t required to rather, into the spasmodic bursts of yesteryear, content to provide a steady, unintrusive dribble of double bass in addition to the band’s patented dirge beat. A questionable recursive groove has found its way into the band’s arsenal, making only fleeting appearance on this album but one that the band will, in all probability, exploit more in the future. Alex Bouks has brought a pronounced, “brighter” sense of melody to the guitar work and his example has inspired Mcentee to play around with varied pacing and phrasing. The pair’s riffing acknowledges their mentors in Slayer on at least one song, perhaps in tribute to Jeff Hanneman’s passing. There is notable evolution in the band’s palette but Incantation are clearly in a transitional state on Dirges Of Elysium, the songs frequently of a disjointed nature that one normally doesn’t associate with the band. The doom elements retain their power but suffice to say that there is no ‘Unto Infinite Twilight’ here; not for the band’s lack of trying either, and it remains to be seen if the band can integrate these parts seamlessly into their new framework. For now, this is an interesting albeit half baked collection of ideas, and certainly not this great band’s finest hour. 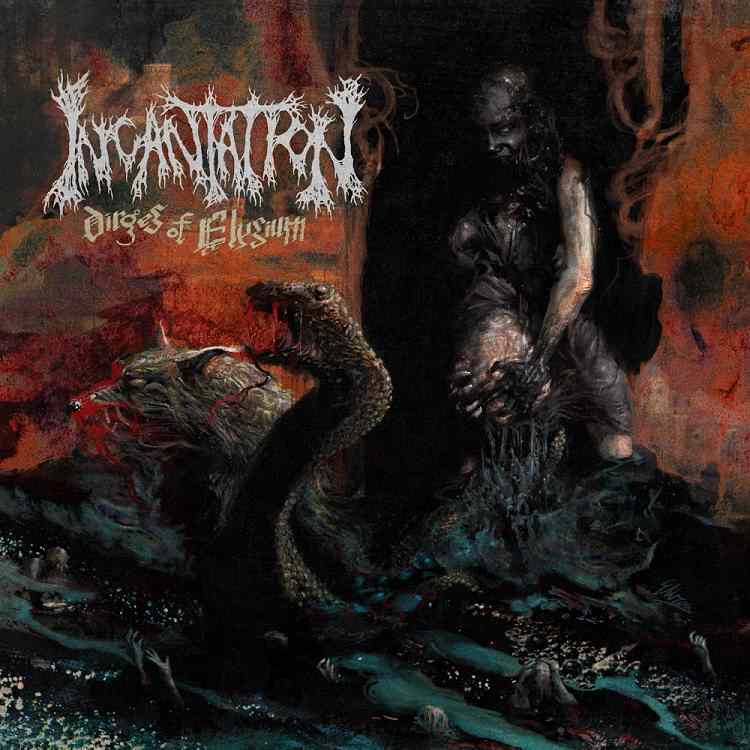 This entry was posted in Death Metal, Music Reviews and tagged Alex Bouks, death metal, Decimate Christendom, Dirges Of Elysium, incantation, John Mcentee, Vanquished In Vengeance. Bookmark the permalink.